The term blepharitis means inflammation of the eyelid. Inflammation means redness and swelling of tissue. If the inflammation becomes severe enough, there can be pain and tenderness in the affected eyelid. Anterior blepharitis refers to inflammation mainly centered around the skin, eyelashes, and lash follicles. Greasy scaling of the eyelid margins characterizes the seborrheic form of blepharitis. There is also redness and thickening of the eyelid margins. This condition is virtually identical to common dandruff, except that it involves the eyelashes rather than the scalp hair. organism, such as a bacterium. Pimples are common examples of abscesses. The staphylococcus bacteria usually cause these small eyelash abscesses. When infectious blepharitis occurs, there is redness, swelling, and thickening of the eyelids. If left untreated, destruction of the eyelash follicles occurs with permanent loss of the eyelashes. Also, hordeola and chalazia (discussed next) will result when the infectious form of blepharitis goes untreated. Even with proper treatment, healing can be associated with scarring and distortion of the eyelid margins. Although bacteria cause this condition, it is not something that can be easily given to another person. 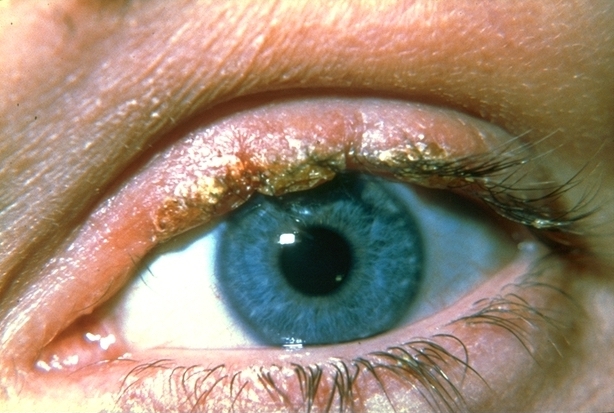 Posterior blepharitis is an inflammation or infection of the meibomian glands of the eyelid. Meibomian glands are oil glands located at the posterior (back) of the eyelid close to the eye. In comparison, the eyelashes are at the anterior (front) of the eyelid. These glands make oil that is an essential part of the eye’s tears. The oily layer is the outside of the tear film that keeps tears from drying up too quickly. When the meibomian glands are infected, they no longer produce pure oils. Instead, they harbor and shed bacteria. They also allow bacterial toxins to flow onto the eye and conjunctiva. 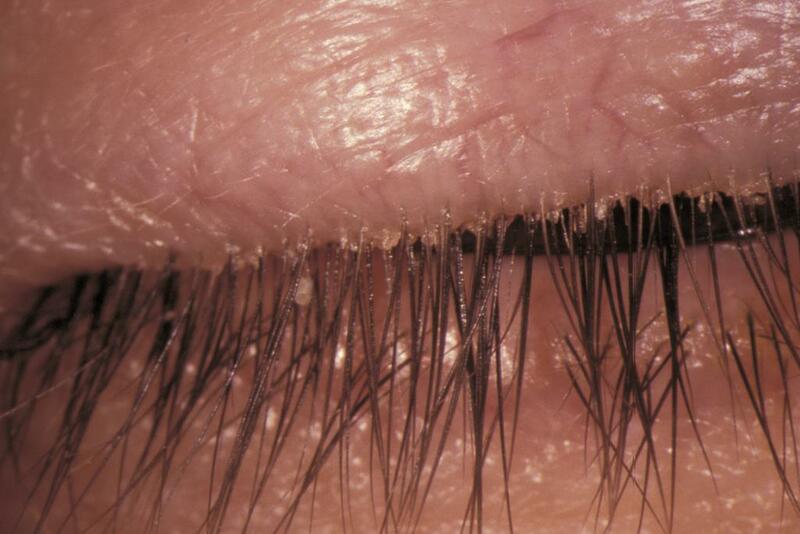 When there is posterior blepharitis, the meibomian glands no longer produce a clear oil. Instead, they create a turbid, or cloudy, oily discharge. This discharge is, in some respects, similar to pus. Close the eyes and gently clean the lids and lashes with a commercial eyelid scrub (such as OCuSOFT, Sterilid or Systane Lid Wipes). If these products are too costly, you can use Johnson’s Baby Shampoo placed on a damp washcloth to clean the lids.